In an interview with Neil McNeil of KSAT Iowa, Ben Carson was asked how he would deal with Islamic extremism in the United States. His response has raised some eyebrows, and some tempers. This was coming on the heels of a turbulent couple of weeks since the second debate. First, he made news by saying a Muslim should not be President. Later in the week, he created some waves when he said that being Muslim should be probable cause for searches and wiretaps. This just falls right in line with his previous assumptions about Islam. At least he is consistent. When asked if he meant that Muslims should have to register their religion to let people know, Carson said “If somebody brought that up to me, if somebody asked if I would do that, I would have to think about it. I never really thought about it.” In an attempt to speak with his eyes open, he looked the reporter in the face and stated “They’re dangerous, these religious extremists. We have to do something”. When McNeil asked the Presidential hopeful if the law was only for members of Islam, or if it would be applied to Christians too, Carson exclaimed “Why would we do that? We can’t persecute people for their religion. It’s unconstitutional”. IF YOU WERE FOOLED BY THIS, DO NOT FEEL BAD. YOU ARE NOT DUMB. BEN CARSON IS SUCH AN IDIOT THAT THIS VERY WELL COULD HAVE BEEN TRUE. IT SAYS MORE ABOUT HIM THAN YOU. 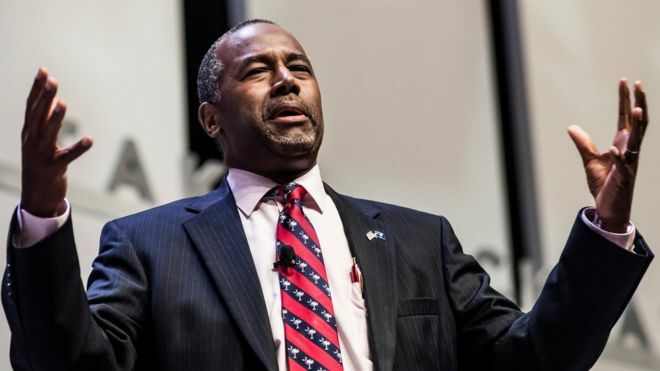 This entry was posted in Opinion, Satire and tagged Ben Carson, Islam, Satire. Bookmark the permalink.